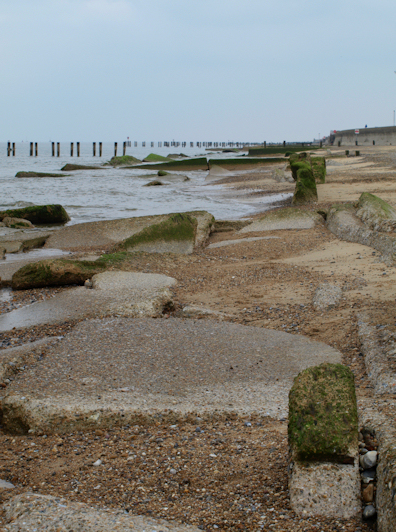 Where is the beach access from Corton? I wander through a caravan site, perched on the cliff. If there was a way down to the beach from here, it has disappeared – dropped over the edge and fallen into the sea itself. So, I walk along the road. Although it is only 3 miles to Lowestoft, and the road is quiet, I am disappointed to be forced away from the coastline. I walk past a wooded nature reserve on my right and come across a small car park with a lane leading to the beach. As I reach the beach, I find two signs. One warns me that the path northwards is impassable. 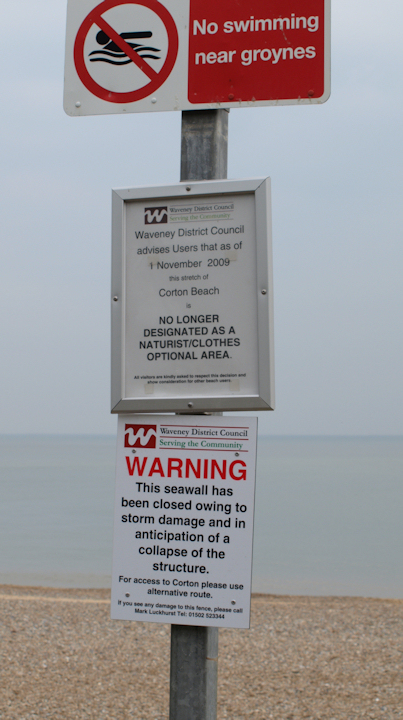 The other signs says “no longer designated as a naturalist/clothes optional area”. This is a bit ambiguous – does it mean that clothes are no longer an option here? I keep a good lookout but, disappointingly, I see no nudists. The sky is overcast, but I feel joyful. My feet are comfortable and my rucksack feels surprisingly light. I must be getting fitter and stronger. Then I realise – I forgot my water bottles and, worse still, my chocolate. 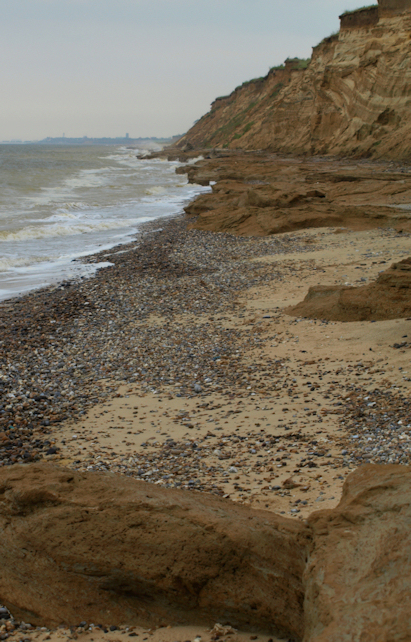 The beach here is wide and I make my way across soft sand to the sea edge, where I walk along the firmer sand, making good progress until I reach the outskirts of Lowestoft. The northern approach to Lowestoft is not a pretty one. I pass derelict building on my right, set in what seems to be unkempt and partly-concreted wasteland. Then I realise it is an old, abandoned, static caravan site. Beyond this, I come across destroyed sea defences and, eventually, warning notices telling me I cannot walk along the beach at this point. I take steps up to a wide, but featureless, promenade. This stretches out into the distance. I see a few people walking, with dogs. Nobody strolls along this promenade for any distance – except me. I see a seal bobbing in the water. Now I pass the outskirts of Lowestoft and, close to the promenade, there are ugly industrial buildings. Steps descend to a lower wall. I ask a couple of strollers if the path continues round. “Yes, and the man adds that I am about to reach the most Eastern point of the British Isles . Ah, I remember now, David Cotton’s website told me of this feature – I had forgotten. And here it is. 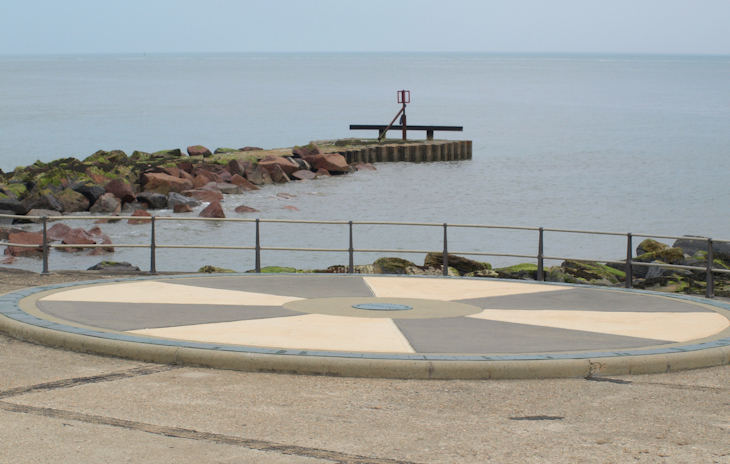 A circle set in the floor, at the most easterly point of the UK. I take photographs and, setting the timer on my camera, even manage to get a photo of myself. The coastal path is marked with street signs. It turns inland from here, through the streets of Lowestoft. I pass through the industrial area first. Workmen in yellow jackets and hard hats wave to me. I wave back. I come across the most Easterly Church in the British Isles and then I am at the top of a shopping street. I buy water and chocolate and continue down the street until I reach the bridge across the River Waveney. As I approach the bridge, a siren sounds and red lights flash. Startled, I realise that the bridge is about to close. I run across and make it to the other side before the barriers close. Cars and pedestrians are now queuing on both sides of the bank, waiting. I have barely time to get my camera out before the roadway is nearly fully raised. A different siren sounds. A fire engine is approaching, blue lights flashing. It has no option – it has to wait too. I walk on and find myself on a very pleasant promenade. 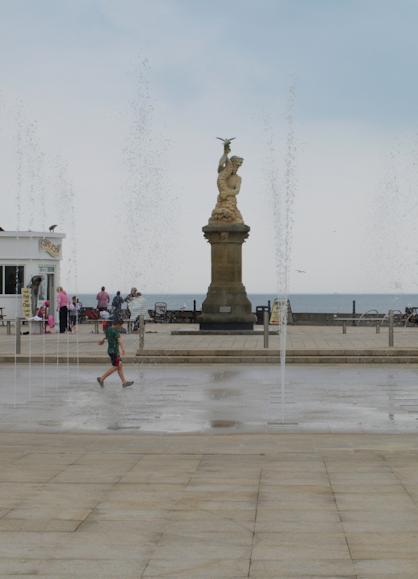 There are nice buildings, monuments and one of those fountains that spurts out from the ground. Children are running through the jets of water, shrieking as they get soaking wet. I use the public toilets – luckily I have 10p. 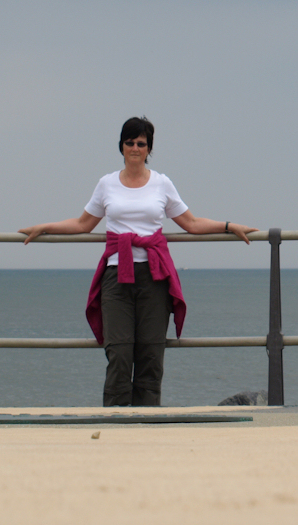 Then I set off along the promenade, heading south. I see coastguards setting up flags on the beach. I pass under a very unimpressive pier structure. Staying close to the waters edge, leaving the promenade and Lowestoft behind, I walk along an deserted beach, stretching out before me in one of those long deceptive bays. There is nothing much between here and Kessingland, my lunch stop. I meet a few walkers with dogs. To my right are low, crumbling cliffs. In one area, the cliff disappears into a gully, and I believe this must be a place endearingly called Crazy Mary’s Hole on my map. The beach is otherwise featureless and I experience that familiar feeling of disorientation. The beach widens. The cliffs grow greener and lower. I come across a fenced off area of nesting terns between the sea and the cliff – I hear their calls. Now the beach curves convexly ahead. There is a narrow strip of sand to walk on. To my right is a wide shingle bank, high enough to prevent me seeing what lies beyond. I walk in a confined world of sea, sand and shingle – unable to see far ahead as the beach curves away, unable to see what is happening landwards as the unforgiving shingle bank obscures the view. When will I know I have reached Kessingland? I check my Trip Journal App on my Iphone. With a GPS reading of my position, I can pull up a map. When this shows I am approaching Kessingland’s access road, I strike inland, struggling over the shingle and across an area of dunes. There is a promenade ahead with buildings and then I spot my husband, leaning against a fence waiting for me. Unfortunately, the pub stops serving at 2.30pm, and it is now 2.45. We are unable to persuade them to change their minds and we have to snack on crisps and chocolate. At least I enjoy a good cider. Setting off again, I walk along the Kessingland promenade until this ends and I follow a track along the edge of the wide beach. I reach an area called Benacre Broad. Signs warn me that I can only walk along the beach to Southwold at low tide. I believe the tide is high at 6 pm and it is now 4pm. The omens don’t look good. But the beach looks passable and I decide to risk it. The walk is difficult now – narrow shingle beach and low, crumbling cliffs to my right. I come across drowned trees and fallen trees. There are clumps of fresh grass on the beach, newly fallen from the cliff. I pass an elderly couple, but otherwise see nobody. I reach an area where there is an inland lake and a bird hide. The coastal path along the top of the cliff has disappeared and warning signs tell me the cliff is impassable. I later learn that this part of the coast is disappearing at the rate of several feet a year. 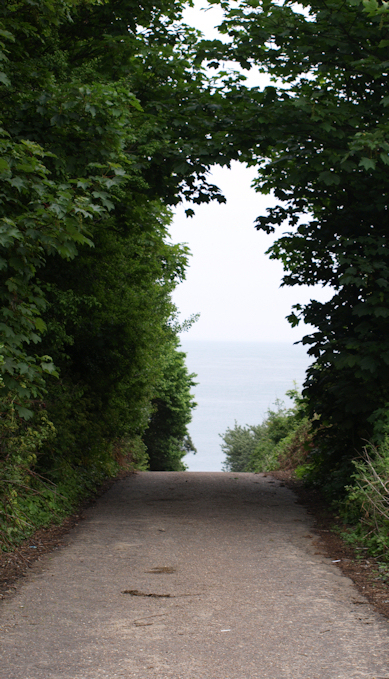 I view the beach ahead of me –in the distance I see the beach becomes even narrower and the cliff grows higher. I can see spray splashing up onto the cliff face in the distance. I hesitate. But I have come so far, I am reluctant to turn back. So I continue. I am alone now. There is a narrow spit of rock between my path on the shingle and the cliff. The shingle narrows and disappears beneath waves. I climb onto the rock at the foot of the cliff. This “rock” turns out to be soft and, almost, feels like mud beneath my boots. It is sticky and slippery. I walk determinedly onwards. Then I reach an area where the rock/mud bank has been washed away for a stretch of a few yards. There is no beach – only water and waves splashing up against the vertical cliff face. My mud/rock pathway continues a few metres away. But, between me and the path is a few feet of nothing but cold water and surging waves. It might as well be a hundred yard gap. There is nothing I can do. I can’t go forward. Reluctantly, I turn back. My phone finally finds a signal and I let my husband know. 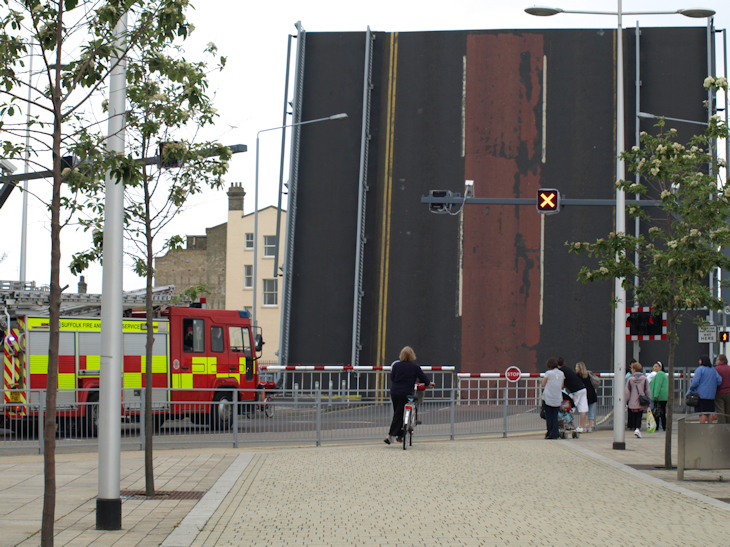 I won’t be making it to Covehithe this evening – not by foot. Back in the Benacre area, I pick up the coastal path as it heads inland. My husband is waiting with the car and my walk, for today, has ended. Things I have learned: on the coast, the wrong time of tide can make the difference between success and failure. 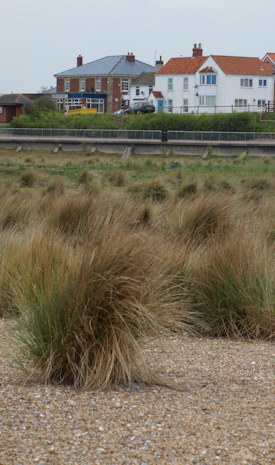 If you are interested in coastal erosion and in finding out about the plans for sea defences in this threatened area, you can read the local Shoreline Management Plan. 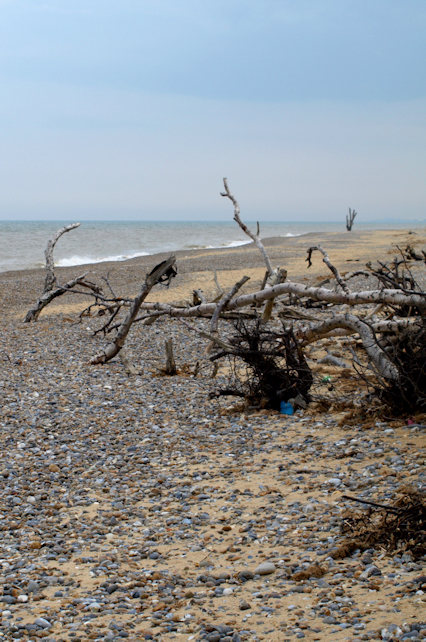 This entry was posted in 03 Suffolk and tagged 03 Suffolk, beach, Benacre, britain, british, cardinal point, cliff, coast, coastal, coastal erosion, coastal walk, Corton, Covehithe, england, Kessingland, Lowestoft, path, photography, sea, shingle, UK, walker, walking. Bookmark the permalink. Hi Noel, I liked Corton, just a shame the sea wall is no longer walkable. Nice place to spend holidays. Hi just read your walk very enjoyable. We live on the cliff top caravan park called Azure Seas and there is access to the beach via a wooden area at the end of the camp. The Sea Wall has now re opened and is an enjoyable walk. this walk was actually quite enjoyable, athough we did confuse the Bird’s Eye food plant for a chemical factory for quite some tiime!! Thank you, William. Very useful information. And good advice to check the tide times in advance, too.